Snap….Crackle…Pop….the salon windows are busted! 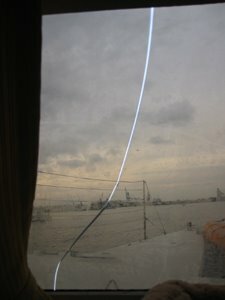 …Cat Maudy’s panoramic port side salon window develops a seismic crack. We love to meet people, work with them, solve their business and technology problems and walk away at the end of the day knowing that my clients are satisfied. Designing software business solutions is what we do for a living, and there is nothing quite like the satisfaction of keeping clients year after year, and making their business lives a little bit easier. Unfortunately, not all companies tackle customer service with the same zest. 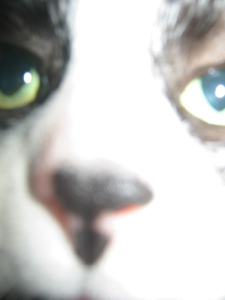 Meet Chesapeake Rigging. “we may have caused the problem, but it’s just a coincidence, and therefore not our fault”. 1) Cat Maudy, built by Bader Catamarane in Germany, crossed the Atlantic, was a charter vessel in the Caribbean and Florida, and under our watch has sailed 2500 miles without the window cracking. 2) the prior owner of Cat Maudy is a world-renowned Swiss designer/engineer, and had the windows replaced (in 2006 by the professionals at Georgetown Yacht Basin) due to 5 years in the harsh Caribbean environment. 6) curved windows can be found on many catamaran designs – try Fountaine for example! 8) without Grissom on CSI, the grim reality, is that we (or a marine survey) cannot prove the absolute cause and affect, so sadly, we are left with “it sure is an amazing ‘coincidence'”! The next stop is a visit to Precision Plastics (located in Beltsville, MD) , the manufacturer of our panoramic windows. The team at Precision Plastics are real PRO’s….they design acrylics for submarines, aquariums, navy boats – big deal stuff that needs to sustain a lot of water pressure. The principal of the company, Greg spent over an hour with Capt Pat, showing him their manufacturing floor, discussing the properties of thermo-molded annealed acrylics versus Lexan, why thermo-molded annealed acrylics are far better for a marine environment over Lexan, and what would be required to resolve Cat Maudy’s fissure. There is no “temporary” solution. 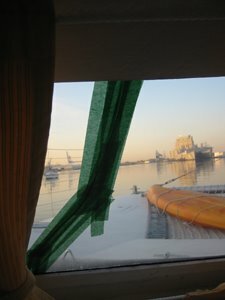 Once a crack occurs, the entire window will need to be replaced and re-installed, before Cat Maudy could safely travel offshore. The trip south this winter is officially cancelled, and we will spend the next few months becoming “experts” on creating a mold for Cat Maudy’s huge panoramic windows, and learning from the experts how to install.